The fifth group within the Family Accipitridae includes three genera. 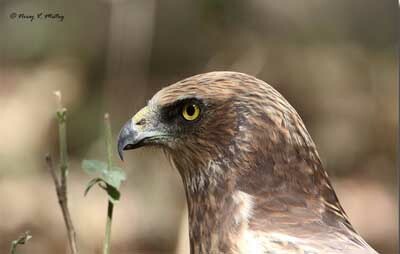 The two species of Harrier-hawks of genus Polyboroides are related to snake-eagles and serpent-eagles, with juveniles fairly similar. The genus Geranospiza has unclear relation. This raptor shares numerous morphological features with the harrier-hawks which are Afrotropical species. It is why we study this species within this article. 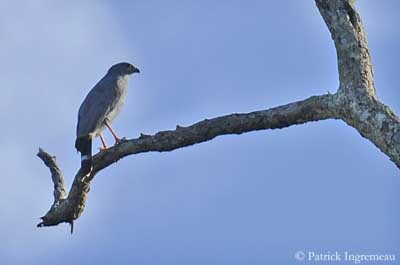 On the other hand, this species is probably related to Neotropical hawks of both Leucopternis and Buteogallus genera. The 16 species of the genus Circus have in common similar morphological adaptations and a peculiar position within their ecosystem or ecological niche. 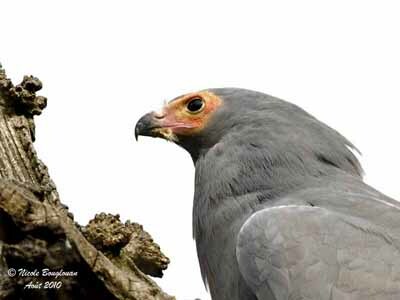 The African Harrier-hawk (Polyboroides typus) and the Madagascar Harrier-hawk (Polyboroides radiatus) are very similar in plumage, but the second is paler. 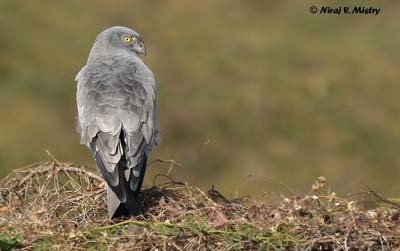 Both have grey plumage on the upperparts, and white underparts barred dark grey. The flight feathers are blackish, and the fairly long tail is conspicuously barred black and white. The voluminous crest is grey. The head shows bare face from yellow to deep red. The slender bill is black with yellow cere. The eyes are dark brown. Legs and feet are yellow. But the peculiar traits of this genus are the double-jointed legs and the small feet allowing the bird to extract its preys from nests, holes or crevices, as well in trees as rocks or banks. It uses the long flexible knee-joints and the bill to reach birds and eggs, bats, small mammals, lizards and various insects. It is able to hang from branches with dangling wings and also hunts by slow, low flying pursuit over the ground or the vegetation. This genus is more arboreal than terrestrial. 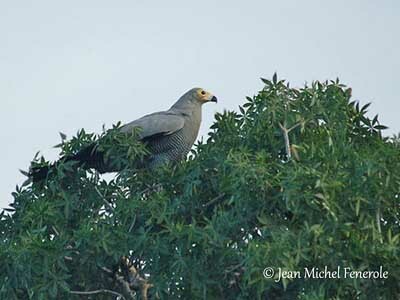 The African Harrier-hawk also takes oil palm and various fruits when available. 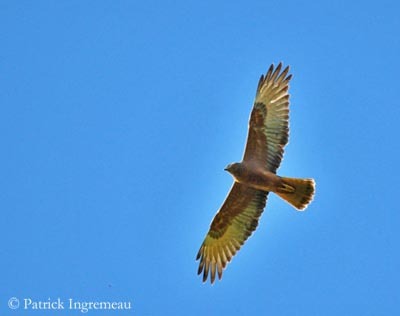 The Madagascar Harrier-hawk is slightly larger, and can hunt larger preys such as flying-fox and small lemurs. It clambers over the leaf bases of several palms and tree species, examines the termite mounds and searches for preys on the ground while moving objects. This raptor is often perched within the vegetation, although sometimes, it can be seen soaring above the treetops. 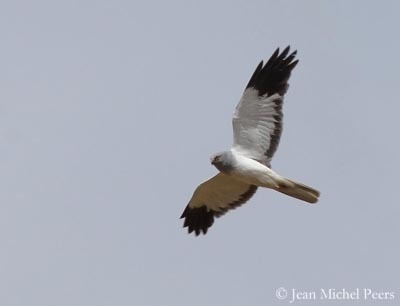 Both species frequent forests and woodlands, but in Madagascar, the Madagascar Harrier-hawk can be seen up to 2000 metres of elevation, whereas in sub-Saharan Africa, the African Harrier-hawk also frequents arid steppes and savannas. 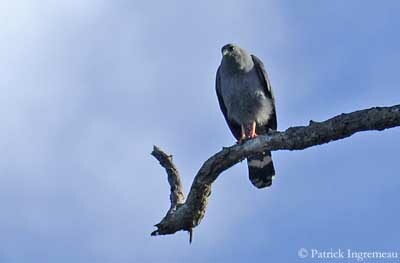 The African Harrier-hawk performs aerial courtship displays during which male and female fly together in acrobatic way, grasping their talons in the air. They build a stick nest in tree or sometimes on rock ledge. The female lays two eggs and parents incubate during 35 days. Usually, only one chick is reared by both adults. 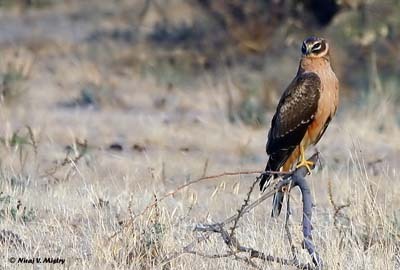 The African Harrier-hawk is found in sub-Saharan Africa and is resident and sedentary in most part of the range, but some seasonal intra-African migrations are observed. 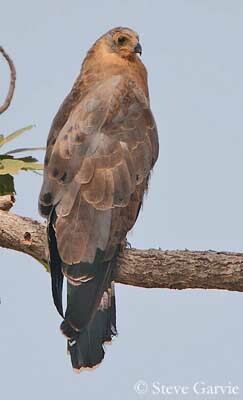 The Madagascar Harrier-hawk occurs in Madagascar except on the deforested central plateau. Both species are common in their range and primarily in forested areas. 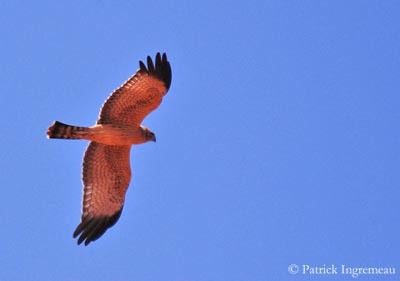 The Crane Hawk (Geranospiza caerulescens) shares some morphological traits with the Harrier-hawks, such as short outer toe, narrow head, weak bill and the long legs with double-joint tarsus. These features could also be an adaptation to its foraging behaviour in trees. This raptor may recall the genus Polyboroides, but it is smaller and less bulky, and the legs are longer. 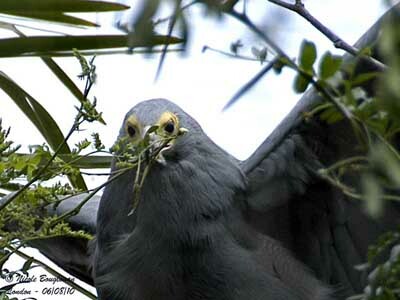 The plumage is bluish grey but varies according to the race and we can see blackish or slate-grey birds. Some subspecies have fine white barring on the underparts as the Polyboroides, and also on the upperwing. The long tail is black with two conspicuous whitish bars and narrow white tip. In flight, a white crescent is visible on the primaries. On the grey head, the bill is black with grey cere. The eyes are deep red. The very long legs and the feet are orange-red. The female is larger with similar plumage. The immature has dark brownish upperparts, streaked head and barred underparts. 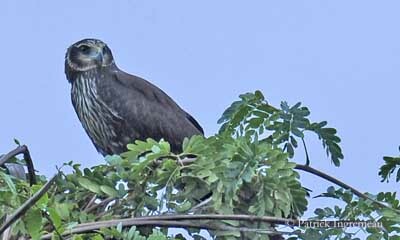 The Crane Hawk is found in forested areas such as dry or rain forest, mangroves, wooded savannahs, gallery forest near grasslands, and often near water, ponds or marshes. This species occurs in South America except Chile and southern part of the continent, and is also present in Central America. It feeds on reptiles such as snakes and lizards, and also takes frogs, bird’s chicks, large insects and spiders. This raptor clings to the tree trunks, and its double-jointed legs are used to reach the preys into holes in trunks, or into the dense vegetation while searching for arboreal frogs. 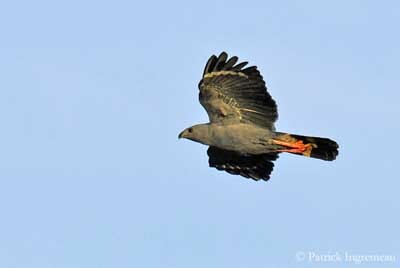 As the Harrier-hawks, this bird is able to hang upside down below the nests when searching for nestlings. 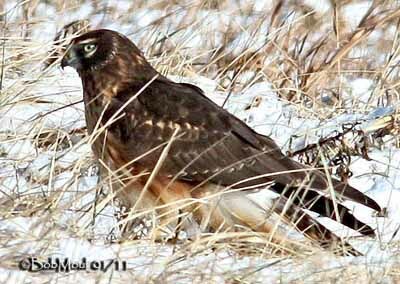 But like other Accipitridae species, it also hunts by diving onto a prey on the ground from a perch in tree, and may fly low from the ground or over wetlands when pursuing a prey, in manner of harriers with flapping-and-glide flight. 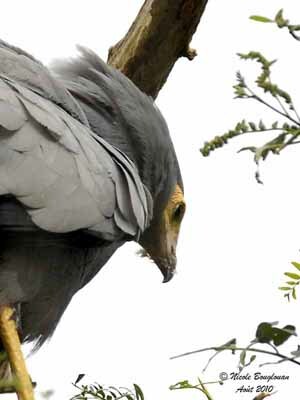 During the breeding season, the Crane Hawk is very vocal and performs spectacular aerial displays and the male feeds the female as courtship feeding. 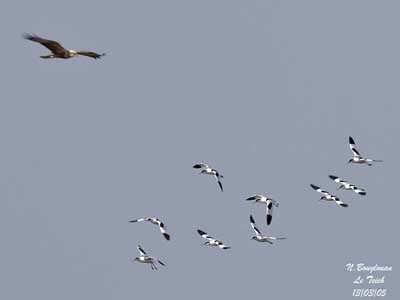 This species is locally common in it very large range, and the populations of Crane Hawks are not globally threatened at this time. Compared to the previous raptors, the harriers are less specialized. They hunt in more typical manner. Their long, narrow wings and the long tail are adapted to their hunting behaviour. They perform flapping flight and pursue agile preys often in difficult conditions. Wings and tail allow them to have good manoeuvrability in flight. They survey the ground by low, buoyant flight. Once the prey is detected, they drop onto it on the ground. They can hover before to dive down on prey. They often hunt by coursing over open areas and attempt to surprise their victims. 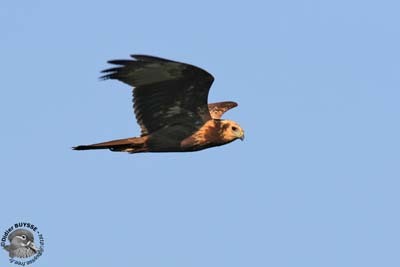 Some of them hunt in the same way but take preys from water surface as they do the Swamp Harrier (Circus approximans) and sometimes the Western Marsh-Harrier Circus aeruginosus). 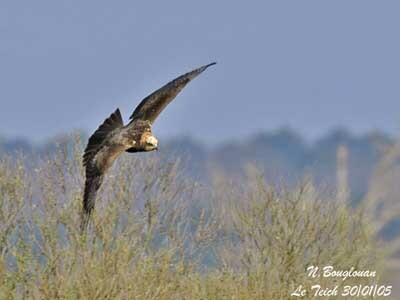 The African Marsh Harrier (Circus ranivorus) also catches birds in flight. Harriers feed on wide range of preys such as birds with chicks and eggs, small mammals, frogs, fish, reptiles, insects and carrion. Very opportunist hunters, they take numerous types of preys according to the range and the availability. They can perform co-operative hunting between mates that increases the success rate of attack on larger and more rapid vertebrates. They fly in straight line at about 15-30 km/hour and forage low from the ground. Male and female are usually different in plumage but with the same pattern. 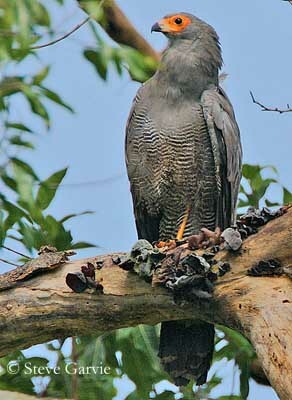 The male is often pale to dark grey, black or brown on the upperparts. Underparts can be uniform, streaked, barred or mottled. 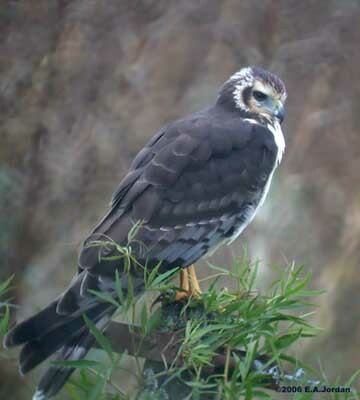 The Spotted Harrier (Circus assimilis) from Australia is unique in this genus with heavily spotted underparts and mixed grey, white and rufous upperparts. 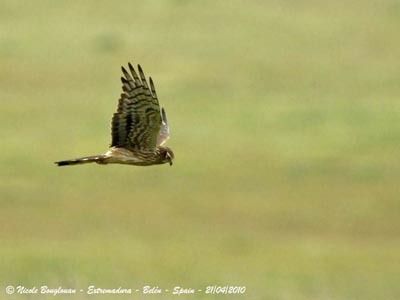 The Cinereous Harrier (Circus cinereus) from South America has prominent white rump and heavily barred underparts. The Pied Harrier (Circus melanoleucos) is black and white and very distinctive. The female is rather brown than grey or black. She usually has rufous-brown to grey-brown upperparts and streaked underparts, sometimes uniform. Immature birds are often similar to females. Harriers have peculiar head pattern, something similar to Strigidae species, with facial disks around the eyes. Maybe another adaptation for hunting purposes… Harriers do not hunt by night, but they often hunt at dawn and they need to find preys. They have keen sight and are able to detect preys while flying. They usually have black bill with yellow cere. Eyes are yellow, as legs and feet too. 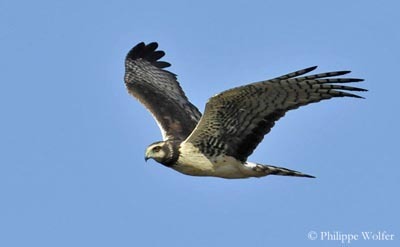 The breeding season show these beautiful birds of prey performing spectacular aerial displays. The mutual soaring of both mates show the upper bird diving onto its partner. This one, often the female, rolls over and holds the talons towards the male. They may grasp each other while flying. Some species perform “sky-dancing” aerial displays, twisting flight or undulating flight while calling loudly. During the nesting period, the male hunts for the family and passes the food to the female while flying. The upper bird drops or lowers a prey item into the talons of its mate. Harriers are very agile and graceful birds in flight. 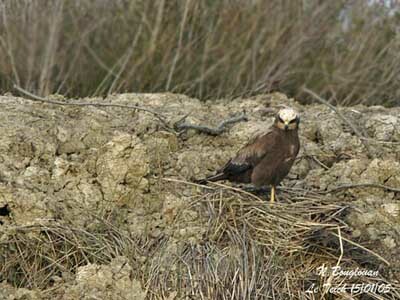 They nest solitary, although the Western Marsh-harrier, the Montagu’s Harrier (Circus pygragus) and the Black Harrier (Circus maurus) may nest in loose colonies. 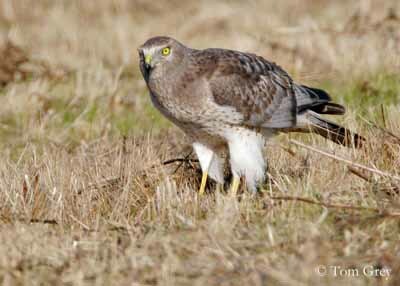 The Hen Harrier (Circus cyaneus) may also nest in crops. Clutches may vary from 2-3, 3-4, 4-5 or 4-7 eggs according to the species and the range. Incubation ranges from 30 to 48 days, mainly by female. The male provides the food during this period and after the hatching. Later, both mates hunt together. The chicks are covered in down and fledge between 35 and 50 days after hatching. They remain with parents for some weeks more after fledging. Usually, more than one chick survives and the young birds are fed by both adults. Harriers occur in wetlands, marshes, swamps, lagoons, lake edges, large reedbeds, grasslands, crops, steppes, meadows… according to the range. They commonly perch, rest and nest on the ground. Harriers are found in all continents except the poles. 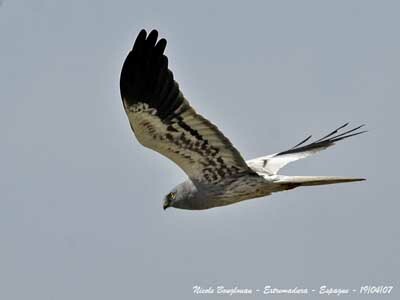 The most widespread is the Hen Harrier (Circus cyaneus) which is present in both Old and New Worlds. 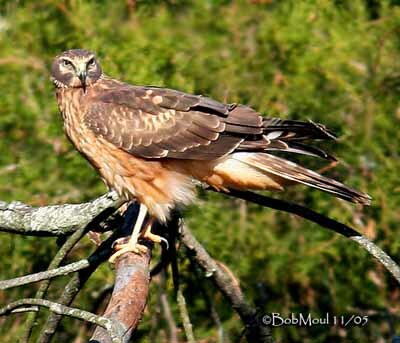 In North America, its name is Northern Harrier (Circus cyaneus hudsonius). Other species are found in Australia, South and sub-Saharan Africa, Madagascar, South America, Europe, India, SE Siberia and Mongolia, SE Asia, S China, Indonesia and Philippines. 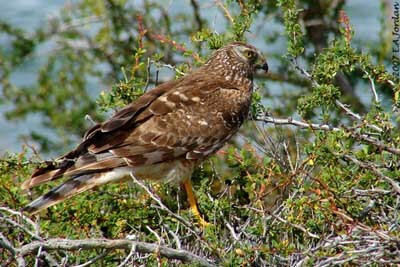 Harriers are mainly migratory, but some species can be sedentary or dispersive, and even resident in suitable habitat. They usually depend on wet areas and move to find marshes or permanent water bodies. These species are threatened by drainage of wetlands, human disturbances, intensification of agriculture, changes in the natural habitat and persecutions. They are locally common and some of them are widespread. 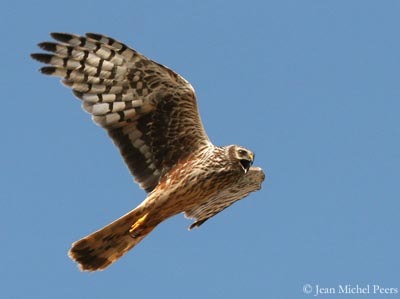 One species, the Malagasy Harrier (Circus macrosceles) is considered as Near Threatened. As well the Harrier-hawks, the harriers or even the Crane hawk, all these raptors need protection and respect. They are threatened by habitat loss and human disturbances, and changes in agricultural practices. Their nesting areas also need to be protected. Several conservation programs are in their way in all countries, but efforts are still needed and the use of pesticides completely stopped. We can hope next day some increase of their populations, and maybe, we will see them again performing their beautiful acrobatic flight displays in the sky.